Snow blowers, or snow throwers as they are sometimes called, can make fast work of clearing snow from your porch, deck, sidewalk, or driveway. They work by scooping up snow through an auger mounted in the front of the machine and blowing it out a chute to wherever you aim it. 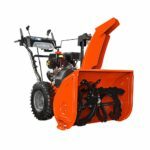 There are three main types of machines – two-stage gas snow blowers, single-stage gas snow blowers, and electric snow blowers. Two-Stage models are the biggest, heaviest, most expensive, and able to move the most amount of snow. They are called two-stage because first the auger shovels snow into the intake, then secondly an impeller shoots the snow out the chute up to 50 feet away. Powered by a gas engine, they typically cost between $600 to as much as $3000 or more. They are best used for very large areas that receive lots of heavy snow as much as 20 inches deep. Single-Stage models are lighter, cheaper, don’t move as much snow, and usually have a smaller gas engine than two-stage models. They do not use an impeller, instead the auger scoops up the snow with enough force to blow it out the chute. Typical prices range from about $300 to $800. They are preferred for medium to large sized areas or smaller areas that receive large amounts of snow up to about 12 inches. Electric models use an electric motor and need an extension cord in order to work. They are quieter, cheaper, and require no oil or gas to operate. However, they do not have the power of gas-powered engines so they cannot clear as much snow. In fact many struggle with snow over 6 inches deep or very wet snow. They typically cost between $100 to $300. These should only be used near to the house in small to medium sized areas. Below we review the best snow blowers from all three categories. For this topic we primarily focused on models that cost less than $1500, with a few exceptions, which is enough money to spend to get a quality unit for home use. We also have a spec comparison chart at the bottom of this article. We selected the Ariens 926060 Professional 28 Hydro Rapidtrak as the best snow blower. This tracked model costs $3,099, but for serious snow removal it is worth every penny. In fact it can move 79 tons of snow per hour. The 926060 was designed for professionals but can also be used by homeowners who have a large driveway or area to clear. 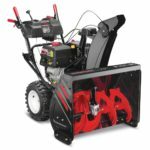 With a 28 inch width, 23.5 inch intake height, and a 420cc engine it can clear deep and wet snow better than any other model on this list and throw it up to 60 feet away. 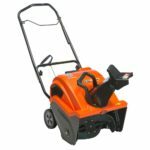 We only recommend the Ariens 926060 Professional 28 Hydro Rapidtrak for extreme circumstances due to the price, but make no mistake you will not find a better snow blower. 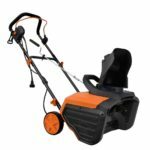 If you hate struggling with starting issues due to a carburetor problem then you will love the Ariens 921049 Deluxe 30 EFI which sells for $1,699. This machine uses electronic fuel ignition which provides easier starting, better fuel efficiency, and constant RPM power even under heavy load. Powered by a 306 cc engine this unit is self-propelled with six forward speeds and two reverse speeds. Maneuvering is made easy by an auto turn system. Other features include a 30 inch clearing width, 21 inch intake, 50 foot max throwing distance, headlight, and heated hand grips. There are other comparably performing snow blowers available for cheaper, but none that provide the worry-free starting power of the Ariens 921049. The best snowblower for under $1,500 is the $1499 Troy-Bilt Arctic Storm 30. This model has a 30 inch clearing path with a 23 in high intake and a 357 cc engine. Despite its size it’s easy to use thanks to its self propel drive system and touch and turn power steering. 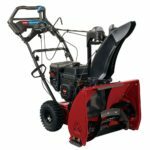 We would not hesitate to recommend the Troy-Bilt Arctic Storm 30 since it can handle heavy duty usage for any size driveway or any amount and type of snow. With a price of $1,399 the Ariens 921047 is the cheapest 30 inch wide snowblower on our list. This machine has every feature you could want including power steering, six self-propelled speeds, remote chute control, electric start, in-dash headlight, and hand warmers. 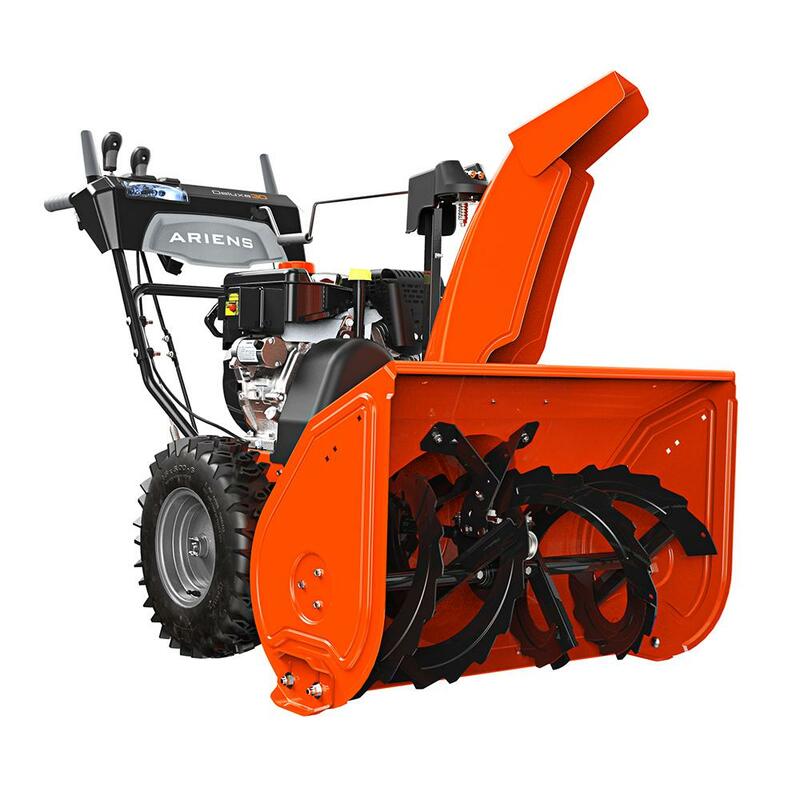 With a 306 cc engine and a 21 inch intake height the Ariens can throw compact snow and ice up to 50 ft. 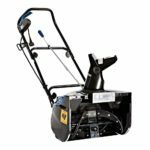 It is another outstanding choice for anyone with a large driveway or space that they need to clear of deep snow, but it might be overkill for smaller areas. The best snow blower available for under $1,000 is the Cub Cadet 2x 28 HP which sells for $999. It was the highest rated model on HomeDepot.com. This 28 inch wide blower with its 21-inch high intake can handle deep snow up to 20 inches deep. The 272 cc engine provides enough power to throw the snow up to 40 ft. The Cub Cadet 2x 28 HP has electric start and a headlight but does not have heated hand grips. The only slight problem with this unit is that it doesn’t quite scrape a surface completely clear leaving a thin dusting behind. The Troy-Bilt storm 2860 was rated as a Best Buy by the leading consumer magazine, but the Troy-Bilt Storm 2890 has all the same features while adding power steering and a quiet 243cc engine for only $100 more for a final price tag of $999. Push-button starting, six self-propelled speeds, large 15 inch airless tires for better traction, and simple one hand chute controls make this thing a joy to use. About the only weakness we found was that it doesn’t quite throw the snow as far as other models at about a max of 30 feet. 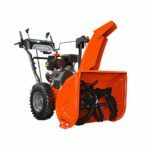 The $1,099 Ariens 921046 has every feature that the 30 inch Deluxe Ariens snowblower has except for a smaller engine, a 28 inch wide clearing path, and no heated hand grips. The 921046 can tackle the worst winter weather by clearing large areas of heavy wet snow and is an excellent alternative to the 921047 since it costs $300 less. The best 24 inch wide two stage snow blower is the Ariens 921045 which sells for $999. What separates this model from other 24 inch wide machines is the 14 inch impeller and auger, compared with most that are 12 inches, which lets it handle heavy snow and not clog. The 921045 uses a 254cc engine with six self-propelled forward speeds and 2 reverse speeds. It has automatic power steering – with no triggers needed, simple crank chute control, electric push starting and a headlight. 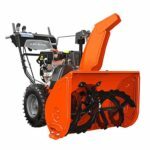 The Ariens 921045 makes a perfect choice for anyone wanting a 24 inch wide model who has a somewhat large driveway and receives lots of heavy wet snow. The $899 Cub Cadet 2x 26 HP is a good value 26 inch wide snowblower. Powered by an electric starting 243cc engine this machine moves forward at 6 different speeds or reverse with two speeds and turns with power steering. 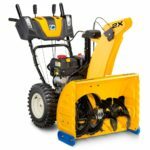 The 2x 26 HP has a 21 inch intake and a 12 inch impeller and auger which doesn’t quite handle wet snow as well as some of the other higher-rated models on this list. However, it is still a worthwhile choice for anyone who wants to save a few hundred dollars. 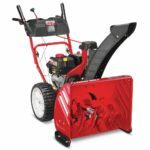 The cheapest two stage snow blower to make our top 10 is the $699 Troy-Bilt Storm 2460. 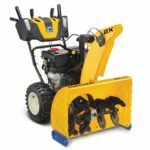 It doesn’t quite perform as well as the other machines to make the list, but it still works good for those of you with medium to large-size areas that need to be cleared of all but the deepest, wettest snow. The main negative of the 2460 is the lack of power steering but it uses new 15 inch airless tires to give you traction so you can still turn easily. We chose the $749 Toro 36002 Snowmaster 724 QXE as the best single stage snow blower. This thing can clear snow up to 14 inches deep faster than even some two-stage blowers will. The 724 QXE features an electric start 212cc engine, 24 inch wide clearing path, 18 inch intake height, and a 10 inch auger. It has an intuitive Personal Pace drive system that matches the speed of its wheels with how fast you are walking and has easy to use joystick chute control. Because it’s so lightweight, you actually might have problems going up a steep driveway or getting traction in icy snow. It’s also not the best for unpaved surfaces, so if you have a gravel driveway you might want to consider a different option. 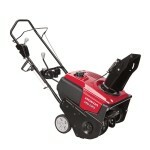 However, the Toro 36002 Snowmaster 724 QXE is perfect for anyone with a paved flat driveway. 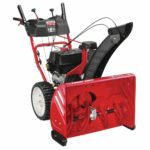 The $729 Toro 38744 Power Clear 721 QZE is ideal for concrete and asphalt surfaces covered with up to 9 inches of snow. This machine can throw snow up to 35 feet away thanks to power from its 212 cc engine, 21 inch wide clearing path, and 8.5 inch auger. The 721 QZE only has one speed that propels the unit forward, but it does have excellent handling. It has a quick chute control while in the operator position. The Toro 38742 Power Clear 721E is the same single stage snow blower as the Toro 38744 minus the operator position chute controls. Instead you have to manually turn the chute by hand to adjust outflowing snow. That small difference saves you $130 on this model which sells for $599. The $699 Honda HS720AS features a 20 inch wide clearing path with a 187cc engine. The Honda is good at snow removal and the overall handling is very good. The snow throwing distance, like all single-stage models compared to two-stage, is only mediocre. The HS720AS has electric start, but does not have a headlight. The controls are also a bit difficult to use. Rounding out our top 5 single stage snow blowers is the Ariens 938032 Path-Pro SS21E which sells for about $514. It is powered by a 208cc engine with push button electric start. Other specs include a 21 inch with 8.375″ auger, and12.2 inch intake. The 93803 has average snow removing capabilities and only one speed. The $229 Toro 38381 Power Curve 1800 secured our top spot as the best electric snow blower. It was also rated as the top electric machine by the leading consumer magazine. 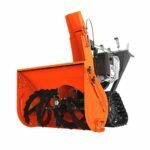 With a 15 amp electric motor it can clear a path 18 inches wide and 12 inches deep while moving 700 pounds of snow a minute. The Power Curve 1800 works well in less than 8 inches of snow, but more than that can cause problems for this machine. It is also the most expensive electric model on our list, but it is still significantly cheaper than gas-powered units. With a price of around $110, the WEN 5662 Snow Blaster does surprisingly well on snow up to about 7 inches deep. It does not work very well with very wet snow but it can throw powdery, dry snow up to 20 ft away. Specs on the WEN 5662 include an 18 inch wide clearing path, 7.8 inch intake height, 7 inch auger, and a 13.5 amp electric motor. 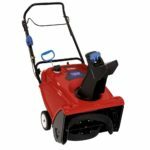 At this price this electric single stage blower is a very good option for someone needing a cheap snow thrower. The $147 Snow Joe Ultra SJ623E has average snow removing ability up to about 8 in, but we found it a bit difficult to maneuver and control. 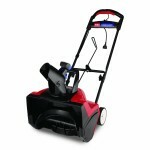 The SJ623E is powered by a 15 amp electric motor and has an 18 inch wide clearing path with a 10 inch intake height. The best snow thrower under $100 is the $99 Toro 38361 Power Shovel. It has a narrow 12 inch wide clearing path so it is not good for large areas, and with just a 6 inch intake height it won’t handle snow deeper than about 5 inches. 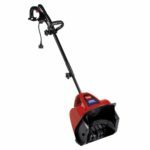 If you only need to clean off a patio, deck, or small driveway that is covered in less than 5 inches of snow then you should consider buying the Toro 38361 Power Shovel because it is the cheapest snow thrower on our list. 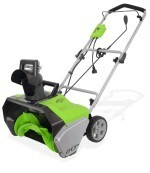 Another model price right around $100 is the Greenworks 2600502. 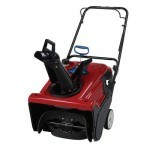 It is the widest electric snow thrower on our list at 20 inches and it has a 10 inch tall intake. It tends to struggle with wet snow over 6 inches deep, but we still recommend it for small spaces with less than 6 inches of snow. GreenWorks 2600502 7.6 Electric $100.86 20 10 NA 10 20 13 amp Electric Motor Yes No No 4 year warranty?